Lebanese Forces leader Samir Geagea told Al-Akhbar newspaper in remarks published on Thursday that Nabih Berri could not remain the speaker of parliament after the upcoming elections. Geagea said that he had discussed this issue with Social Affairs Minsiter Wael Abu Faour, and both agreed that following the upcoming parliamentary elections “it would be unacceptable to return to what was done in 2009,” when Berri was reinstated as speaker. Lebanese leaders are currently debating the best electoral law to be adopted for the next parliamentary elections in 2013. ‘Speaker of the House’ is supposed to be impartial and make sure the ‘debating rules’ are followed by the others. To keep ‘order’ in government. Hmmm … searching … searching …. searching …. Well, obviously again, your research is faulty. What country’s blogs do you do research in? Jumping ahead in time …..
‘In some countries such as the United Kingdom and the Republic of Ireland, this has developed into a convention of scrupulous political neutrality and the speaker resigns from his party, votes only by convention to ensure the government does not fall, and is either not challenged (in the UK) or automatically deemed elected if re-election is sought (in Ireland). Despite these conventions, the speaker is usually elected from among the members of the assembly by the members, and whips are not allowed to be among the selection. In the United Kingdom, a speaker is normally chosen from one of the two largest parties. These conventions do not apply in all countries. In Canada, major parties routinely field candidates against a speaker seeking re-election, although there have been exceptions such as the 1968 general election when the parties agreed not to nominate candidates in then-speaker Lucien Lamoureux’s constituency. But I could grant you a slight reprieve when looking at Australia … perhaps you researched there but do not understand the implications fully … which is that Aussie voters still want the speaker to speak for them if they elected him/her … although the position still has it’s job-function, which is ensuring the rules of the ‘house’ are followed. thats right he had to help hariri read his speech once….or you forget?? gagea has a short memory…was it not berri that agreed to allow him out of jail? part of the agreement was berri stays house speaker? Dateam, 5th and co only like to remember what suits them. Its the same old sad story with most of society. . I think it would be good to simply be rid of Berri and all of the ‘street-turd’ warts clustering around his you-know-what. Wow Lebanon1o452, I’ve also been noticing the same thing for a while now. Dateam, 5th and co only like to remember what’s suits them. Its the same old sad story with most of society. .
Well, you need to get the majority first. Don’t count your chickens yet. 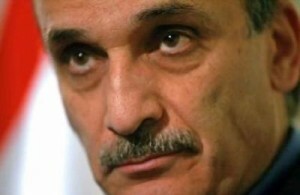 Our glorious leader will get the majority and he will make the decision, I thought you knew that Mr. Geagea ….!!!!! Dory said his brother was killed by Syrian agents. Geagea had nothing to do with it. dory does what dory told otherwise same happens to him…that was gagea..
A big explosion in Ashrafieh… Nchallah ma yeb’a 7ajar 3ala 7ajar be Souria… Bashar will burn in HELL… But before he goes there he will have his d!ck chopped off and shoved up his Syrian A55. It is unacceptable for any of these clowns to be re-elected, for years now we live in decline, it’s time for a change, if we always elect the same people we will always be in decline, a very simple concept that we lebanese people refuse to understand.